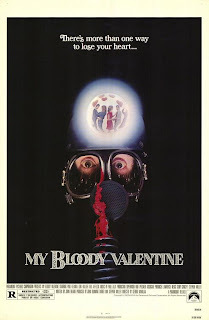 Tag line: "Cross your heart...and hope to die"
I've never actually complied a list of my favorite 80's slasher films, but if I ever do, 1981's My Bloody Valentine will be right up there at the top! Unable to make a go of it on the West Coast, TJ (Paul Kelman) returns home to the small mining community of Valentine Bluffs. He's none too happy that he has to once again work in the mines, but TJ has an even harder time dealing with the fact his old girlfriend, Sarah (Lori Hallier), is now dating his best friend, Axel (Neil Affleck). As Valentine's Day approaches, however, lost love and romantic rivalry will take a back seat to murder. The trouble started twenty years ago, when a Feb. 14th accident killed five miners and trapped one, a man named Harry Warden, below ground for several days (To survive the ordeal, Harry had to eat the remains of his co-workers). Left mentally deranged by the incident, Warden escaped from a state institution exactly one year later and murdered several of his former supervisors, vowing to return each and every Valentines Day unless the town's annual dance was permanently canceled. After 20 years, both the sheriff (Don Francks) and Mayor (Larry Reynolds) feel enough time has past to once again hold their community's beloved Valentines dance. But are they tempting fate by doing so? As Michael Myers was patrolling the streets of suburbia in Halloween, and Friday the 13th's Jason Voorhees set up camp in the picturesque woods of upstate New York, the killer in My Bloody Valentine was bringing chaos and carnage to a working class district, a place where life was already far from simple. 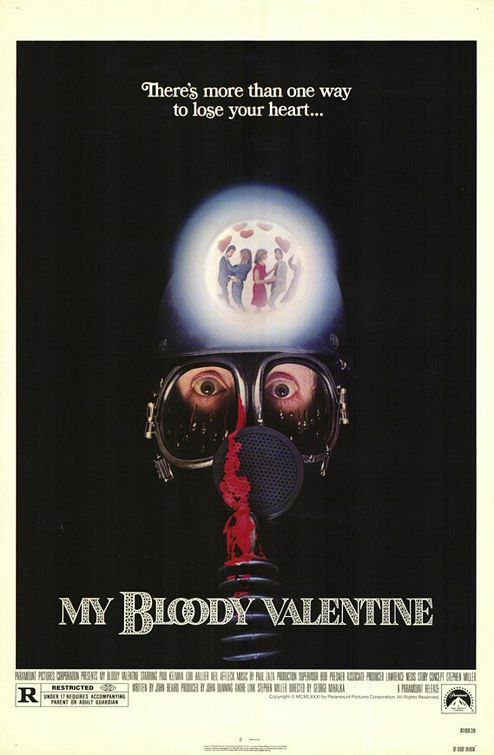 Instead of horny teens, My Bloody Valentine gives us hard-working guys who risk their lives in the mines day in and day out, and while we realize holding the Valentine's Dance, in spite of the obvious dangers, was the wrong thing to do, we know why they were doing it. For the men and women of Valentine Bluffs, this party meant more than an opportunity to get drunk and act crazy; it was an escape from the humdrum of their everyday lives. My Bloody Valentine features a cast of relative unknowns, yet all of them do a fine job capturing their character's general malaise, as well as the desire to break free of it. We may not agree with their decision to party, but we sure as hell understand it! I liked the characters in My Bloody Valentine, yet I was also blown away by the shocking nature of the film's gore. One of the first victims, an older lady named Mabel (Patricia Hamilton), whose only crime was helping out with the decorations, is murdered in the town's laundromat. Her heart is torn from her chest, and her body stuffed into a clothes dryer, which is then switched on. As you can imagine, by the time poor Mabel was found, she was in a terrible state. And compared to what happens to a few later victims, I'd say 'ole Mabel got off easy! With gruesome kills carried out in a working-class setting, My Bloody Valentine is a "cut" above the rest (pun intended..and my apologies). Page: Sorry you couldn't get through it..it's a slasher classic (but then, I guess I can understand, especially if you were traumatized by Texas Chainsaw Massacre! That would be a TIUGH movie to watch as a young kid).